On November 20th, 2000, it was 25 years since General Franco died. 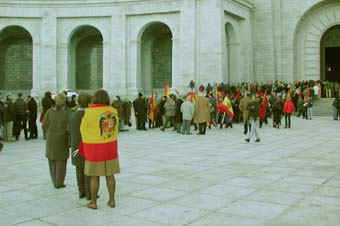 At a funeral mass held November 18 the same year, in relation with the anniversary of Franco's death, thousands of Fascists gathered in the basilica in Valle de Los Caídos - the valley of the fallen. (those killed in the civil war). 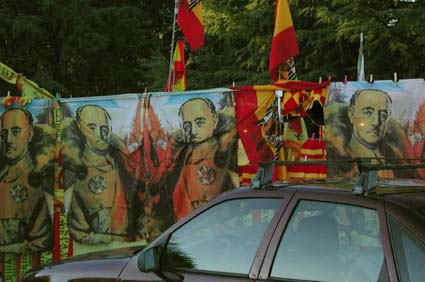 and pictures of "El Caudillo" Franco. There was a long line with mixed people waiting to enter the funeral mass. consider that they have grown up in a democracy. the foundation who organized the mass. flag warmed her up a bit? 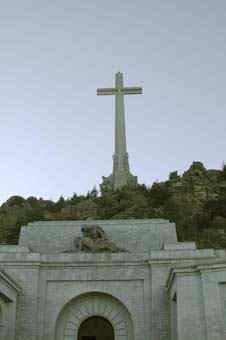 The war monument in Valle de Los Caídos - the valley of the fallen, - consists of a stone cross placed on the mountain top Cuelgamuros, situated between Escorial and Guadarrama, at a height of 5768 feet. The cross measures 492 feet and cut below 860 feet into the bed-rock the basilica is located. There you find the graves of Franco and the founder of the Falangist Party, José Antonio Primo. The Monument was from the beginning meant to serve as a burial ground for all those killed in the civil war and it took 47 years to construct. Within the area there is also a monastery. The decoration in the basilica is a bit terse and in Stalinist style. You can hardly walk away without feeling touched. Especially when you se many visitors placing flowers and making the sign of the cross in front of the graves of Franco and Primo de Rivera. When the sky is clear you can see all the way to Madrid from the 7.4 acres huge, open space outside the basilica. 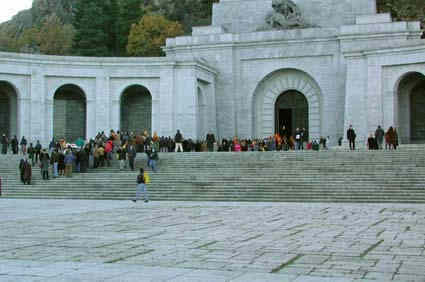 Valle de Los Caídos is situated 36 miles from Madrid and you can easily combine a trip to the valley and the monumental monastery El Escorial during one day.